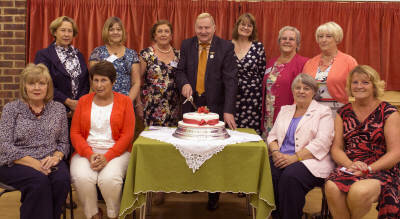 We celebrated our 35th (Coral) Anniversary at our AGM on 1st October 2014 and were delighted to welcome Brenda Eyers, our Area Vice-Chairman, plus honorary members to share our evening. Helen Bird gave a most entertaining floral demonstration entitled 'This is Coral My Way', in which she managed to incorporate many shades of coral. We then concluded our evening by enjoying a glass of sparkling wine and a slice of delicious celebration cake, which had been made by Jane Eastall. Back row - Teresa Scragg, Jayne Potter, Lesley Cooper, David Thomson, Susan Thomas, Margaret Salmon, Jean Bruce. Seated - Susan Franklin, Hazel Lawrence, Jane Eastall, Cheryl Brown.